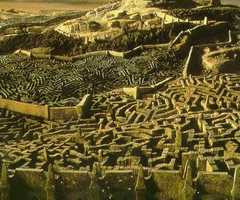 Labyrinth. 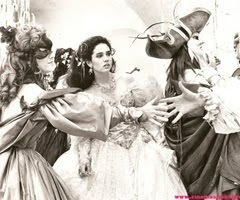 Made in 1986, and featuring Jennifer Connelly as Sarah and David Bowie as Jareth the Goblin King. 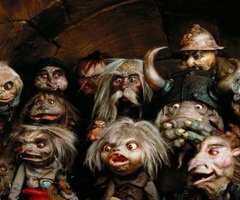 It's Directed by the late great Jim Henson (The Muppets) Produce by George Lucas (yes Star Wars George Lucas), Screenplay by Terry Jones (from Monty Python) and the Original Concept os by one of my favourite artists of all time Brian Froud. 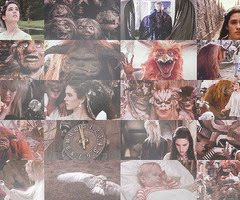 It's an amazing fantasy story about a girl whose baby brother is stolen by the Goblin King and she has 13 hours to travel through the labyrinth to the castle at the centre to rescue her brother. 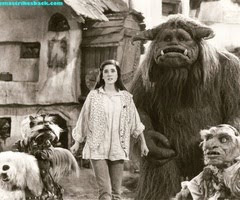 Along the way she meets a variety of different characters - good, bad and indifferent - including Hoggle and giat monster Ludo (I love Ludo). The soundtrack is amazing. 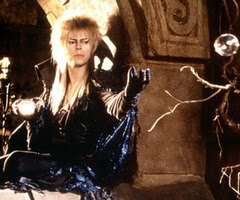 Including original songs by David Bowie (Within Me, Magic Dance, As The World Falls Down) and it's where my love for David Bowie started. Just when I think you can't get anymore awesome, you do this! are you sure that you aren't my secret twin. Labyrinth is my favourite movie ever. Has been since I was aournd 4. It's been my favourite since the first time I watched it as a child. I don't remember. I've had a copy of video for years, and even watch it on video sometimes, (even though I have it on DVD (twice) and blu-ray) just to re-live my childhood. i remember trying to watch this and i absolutely couldnt finish it lol. too scary for me haha.